34 pages were found with this tag. In this podcast, Ricardo talks about the PMI Global Congress 2013 which took place in New Orleans, Louisiana, USA. He makes a brief summary of his perceptions of the key topics of the event, such as, how the project manager can practice and improve his, or her, leadership and influence skills. Ricardo also talks about the importance of participating in the PMI Global Congress, especially for the great opportunities for learning and networking. In this podcast, Ricardo talked directly from Marseille, France, during the PMI Global Congress that brought together participants from 37 countries. 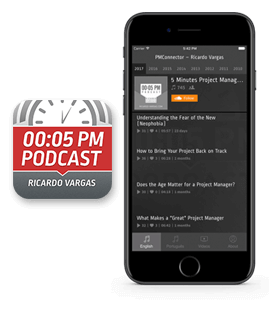 In this podcast, Ricardo talks about the VI Brazilian Congress of Project Management, he explains that this is the most important event in Brazil because is promoted for all the chapters in Brazil. Ricardo says that the one of the global directors of PMI - Ricardo Triana will attend the event beyond the astronaut Marcos Pontes and other major conferences. In this podcast, Ricardo talks directly from Dallas where the Global Congress of PMI is heppening. He talks of the Leadership Meeting, the persons who received awards and Brazilians who are attending the event. He also comments on the lectures and speakers who will make presentations, including on the presentation that he will hold tomorrow. In this podcast, Ricardo talks about the removal of foreign professionals who were in Libya when the political crisis happened. He explained that this was a crisis situation, where changes and variations in the environment are not supported and you have to take an action that is unusual. Ricardo says that this work of removal was extremely successful and gives five tips for managing crises in projects. In this podcast Ricardo presents the highlights of the conference realized last week in Amman, Jordan. The event discussed the association between leadership, governance, execution and strategy. Ricardo leaded the discussions about execution and projects. In this podcast Ricardo makes comments about the cover of the British magazine The Economist on 14 of November, 2009. The magazine presented the opportunities in Brazil and how the country is dealing with the growth. It will be a unique opportunity for superior practice of Project Management and certainly the biggest challenge for the future.